Before American Horror Story: Coven, The Witch, or Lords of Salem, there was a stylish teen witch movie called The Craft. The portrayal of witches always showed them as old and/ or goofy and/or set in the past. Dare I say, when The Craft came out in 1996, it was NONE of these things AND it shaped a generation! I saw The Craft at the movies and was immediately enchanted ~ No, seriously! I could relate to these girls on many levels. At it's most basic, it's about a natural witch that moves to Los Angeles with her family and starts at a new school, only to be welcomed by a coven that's on a power trip. I went to a Catholic High School, was an outcast, and listened to goth music. I could be them...or I am one of them? I can't be the only one that felt this way, so let's chat about what makes The Craft a movie with staying power. 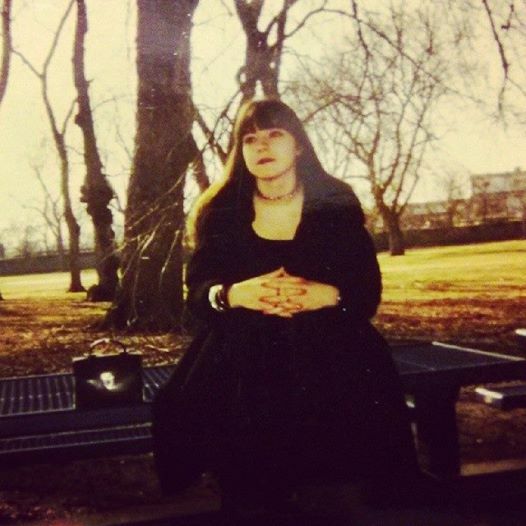 Nancy outside of school in her lace and velvet layers. If you were wondering, going to a Catholic School is NOT how it's pictured in the movie. (They should have consulted with me. For a better take on Catholic High Schools, watch Donnie Darko. Lol.) Why are the Catholic Schools in movies or on TV always co-ed? Mine was an all girls school, and NO I'm not repressed. The only difference was I had to wear a uniform everyday. It consisted of a button down shirt ~ no polos allowed, a color coded name tag (the color represented what grade you were in), a kilt pin, a kilt and NO sneakers unless you're in gym class. The kilt had to come down to the floor if you knelt - otherwise it was grounds for detention. Most of the girls rolled them up at the waist to make them shorter. These four girls from The Craft would have spent most of their days in detention for dress code violations! That being said, let's talk about the fashion in the movie, since the 1990s are back. Is it wrong I love the over the knee socks, chunky shoes, layered lace skirts, crushed velvet, granny boots, and layered chokers/ necklaces? In my mind these are fashion essentials that never are out of style! Or just goth wardrobe staples? One of the most quoted lines from The Craft is "We are the weirdos mister." You can find it on T shirts, pins, posters, and coffee mugs. It's true, the four girls in the coven are outcasts, but I wouldn't call them "weirdos". Rochelle is black at a mostly white school and is discriminated against, Bonnie has scars on most of her body (I always wondered how she got them), Sarah is new to the school and tried to commit suicide because of the natural witch hallucinations she has, and Nancy is poor, and she lives with abusive alcoholic parents. I want to know how she could afford to go to a Catholic school? My family has always been middle class, but attending a Catholic School is expensive. I was on the work/ study program and cleaned classrooms after school to get a discount on my tuition. Sure I got made fun of, but I didn't care. The teachers loved me. 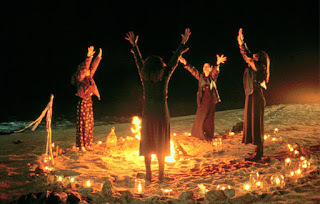 The Craft showed teen witches doing rites based on real Wiccan rituals. The producers consulted with witches to make the scenes accurate. I thought this was impressive, and from what I've read, after seeing this movie, people did try to invoke Manon ~ only thing is, he was made up for the movie! That's how real it seemed! Usually when rituals are in movies, they are either not shown or are just sing songy rhyming and lots of blood. There's a rumor going around that they are making a sequel to The Craft. I'm not sure how I feel about that yet, but why not? There is a musical version and a drag queen version, so I guess The Craft isn't going away any time soon. And really being a "witch" is a way of life, not just a movie, so Remember the Rule of Three and Blessed Be.